Frontiers can be found in all directions. Frontiers of time and space, as well as frontiers of courage, devotion, love, hate, and the outer limits of the human spirit. This outstanding collection of stories by one of science fiction's premier talents spans the length and breadth of history and the universe, while exploring thought-provoking new ideas and dilemmas. From the Baghdad of the Arabian Nights to a vast interstellar empire thousands of years in the future, from the Vatican to a one-man vessel drifting in the vast emptiness of the asteroid belt, from virtual reality duels to the subtle intricacies of time travel and a golf tournament on the Moon, here are tales of scoundrels and heroes, scientists and explorers, aliens and artificial intelligences, and even a young Albert Einstein. 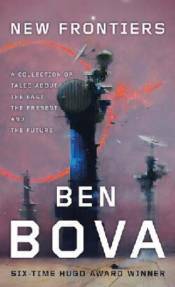 Each of them stands at the border of a new frontier and must venture out into unexplored territory--thanks to the limitless imagination of Ben Bova.